Centre work will be organised around workstreams (WS) and cross-cutting themes (CCT) managed by strategic leads, typically one with alcohol and one with tobacco expertise, who will identify research funding and other relevant opportunities, coordinate new project development, ensure an appropriate mix of disciplines and alcohol and tobacco expertise in research proposals, involve junior researchers wherever possible in this management process, and provide regular updates to the Strategic Management Group. Here we investigate the determinants and risks to individuals and society of tobacco and alcohol use and ask: can current theories of tobacco use and behaviour change be applied to alcohol? We explore how population-level policies and interventions can be applied and developed to prevent harm from tobacco and alcohol use. We assess how interventions to promote smoking cessation and reduce excessive alcohol consumption can be improved. Certain 'harm reduction' strategies can be applied to reduce direct and indirect harm from tobacco or alcohol use in people otherwise resistant to changing their behaviour. We assess the political, social and ethical barriers to more effective tobacco and alcohol policy and how these can be overcome. We examine how these industries influence us as consumers as well as policy makers to maximise their profits. 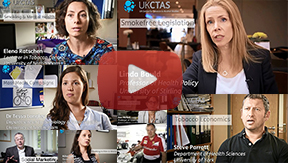 We aks: can tobacco & alcohol policy address conflicting health and commercial interests? Tobacco and alcohol use is often characterised by inequalities (e.g. people from disadvantaged communities are more likely to smoke) and this theme will run through our work on each of the above research areas. We utilise large datasets, including primary healthcare databases and national surveys, and have developed the Nottingham Tobacco Control Database to examine the effects of policy on smoking behaviour. We incorporate cost-effectiveness and health economics analyses into our research, as policies that are effective in practice, must usually be shown to be cost effective in reducing tobacco and alcohol use in populations.